The What: At InfoComm 2013, Planar Systems announced that it is adding multi-touch, multi-user capabilities to its Planar UltraResTM Series 4K LCD display product line. The What Else: The addition of touch technology to the Planar UltraRes Series line of 4K displays combines a multi-touch experience with stunning 4K image clarity. It offers a solution for professionals who seek to collaborate or annotate using a large viewing area, high image resolution and enterprise-level features. 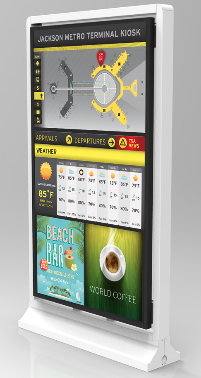 It is also designed for public display applications such as way-finding, product catalogs and any interactive digital signage designed to promote customer engagement. • A multi-touch, multi-user experience: Planar UltraRes Touch offers six simultaneous touch points, allowing multiple users to collaborate and interact at the same time. The display recognizes the full range of common touch gestures including tapping, scrolling, pinching and rotating. The large 84” size lends itself to multiple users. • 4K accuracy: With a native 4K resolution of 3840x2160, Planar UltraRes Touch provides four times the resolution of a full HD display. Touch brings viewers closer to the display and Planar UltraRes Touch delivers sharp clarity even at these close viewing distances. • Landscape and portrait orientations: Planar UltraRes Touch supports both landscape and portrait orientations, providing the flexibility needed for a wide range of applications, all at a display size which mimics the human scale. • Advanced design and function: Planar UltraRes Touch provides a sleek design for both function and style. It has a logo-free metal bezel and a range of digital connectivity options. Using the Planar Profile mount, it installs less than 4 inches from the wall, making it compliant with the Americans with Disabilities Act (ADA). • Planar UltraRes Touch LX offers six simultaneous touch points and 350-nit brightness, making it useful for meeting rooms and control rooms for whiteboard, collaboration, video conferencing and presentation applications. • Planar UltraRes Touch MX provides six simultaneous touch points, 500-nit brightness, and both landscape and portrait modes, a version for public venue and higher ambient light environments for branding, advertising and interactive digital signage applications. • Planar UltraRes Touch 3D includes six simultaneous touch points, 420-nit brightness, and 2D and 3D viewing. It’s a model for customers who work with 3D and 2D visual information for big data analysis, simulation and a range of uses in the design industry.